(Procyon lotor) Raccoons are plantigrade animals, walking on the entirety of their foot – heel to toe. Bear and humans do this as well. Raccoons are highly intelligent and have a manual dexterity that comes close to that of apes. Their long delicate fingers easily open trash cans and doors. What does the Raccoon eat? They are true omnivores and are opportunistic in their diet. They will eat fruit, fish, insects, berries, nuts, eggs, small rodents, grapes, corn, crabs, crayfish and anything edible you may have left in the backyard. It was once thought that raccoons washed their food. They do not. 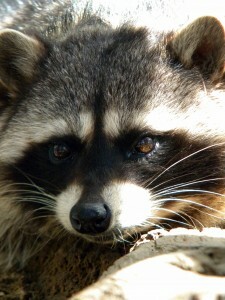 Raccoons have a highly sensitive sense of touch which water helps to enhance. Even when water is unavailable, raccoons will use the same motions while they manipulate their food or objects they are interested in. This tactile experience gives the raccoon a better sense of what it will be eating. It is as if they “see” with their hands. Raccoons can live for 15 years, but most only live to be 5 or 6. How many Raccoons can be born at a time? Raccoon kits (usually 3 – 6 of them) are born 2 months after mating. They are weaned by 8 weeks, and soon after will go on foraging trips with their mother. Native to North and South America with a range that extends from southern Canada to the northern reaches of Argentina. Raccoons are plantigrade animals, walking on the entirety of their foot – heel to toe. Bear and humans do this as well. Raccoons are highly intelligent and have a manual dexterity that comes close to that of apes. Their long delicate fingers easily open clam shells, trash cans and doors. The largest raccoon on record weighed over 60lbs. Dillinger – arrived in 2005 and was very young. Dillinger had quite a few skin problems at first and it took a while to resolve them. His mothers had been killed and he had to be hand raised from a very young age, he is imprinted and cannot be released. Bonnie and Clyde – are siblings and came to us in 2012. They were orphans and had to be hand raised from the time their eyes were closed. They also imprinted and could not be released since they had no fear of people. Abbey and Gibbs – are also siblings. Their story is the same story as Bonnie and Clyde’s. Vincent and Tosh – came in 2011 although they are not related. Vincent had been attacked by someone’s dog when he was very young. They kept him for several weeks and by the time we got him, he was already imprinted. Tosh was also raised from a very young age. Tosh and Vincent are animal ambassadors and are often used for programs. The other raccoons can be seen playing on exhibit every day and they do have a lot of energy! They are often given behavioral enrichment to keep them busy since they are so intelligent.